Welcome back to Day 3 of the Gina K. Designs September blog hop! The release is now available over at Gina K. Designs and can be found HERE under the "what's new" tab. 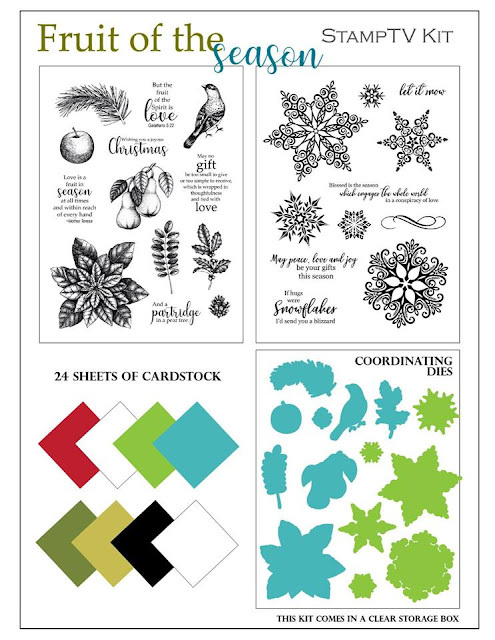 Today the design team is featuring the Gina K. Designs StampTV Kit - Fruit of the Season and Sparkling Snowflake stamp sets. This set is full of goodies and the stamp sets are to die for, you will not want this set to pass you by. There is a prize up for grabs for each day of the hop. Just leave a comment on each stop of the hop for a chance to WIN a $50 Gina K. Designs gift certificate! A total of THREE certificates will be awarded. The winners will be announced over in the StampTV Big News forum a few days after the hop has ended. 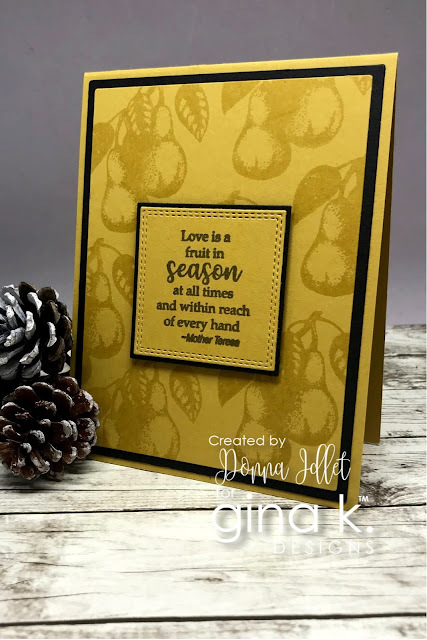 My first card features the "Fruit of the Season" stamp set from the Gina K. Designs StampTV Kit. I randomly stamped the pears on the background of my card with the Gina K. Prickly Pear ink. Isn't this a beautiful color? I then stamp the sentiment from the Fruit of the Season stamp set with Gina K. Charcoal Brown ink. I die cut the image with the Gina K. stitched and double stitched dies and adhered the layers together and added them to my card. My second card I am using the "Sparkling Snowflake" stamp set from the kit. I used the newly released Rubber Background stamp "Delicate Snowflake" for my background. I stamped it with versamark, used the Gina K. fine detail white embossing powder and heat set the snowflakes. I then blended Gina K. Turquoise Sea ink with a jumbo sponge dauber heavily around the edges and lightly toward the center. I then took a dry paper towel and whipped the in off the snowflakes, so they will stand out. 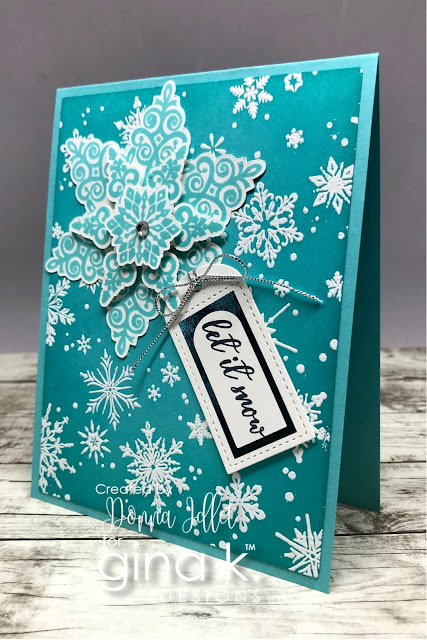 I then stamped several of the snowflakes from the "Sparkly Snowflake" stamp set with Gina K. Turquoise Sea ink, die cut them and layered three of them together, using foam squares between the layers to give the snowflakes dimension. I adhered it to my card. I then die cut the tag from the Gina K. Foil Mates Tag Borders and foiled it with Gina K. Turquoise foil, I stamped the sentiment from the "Sparkling Snowflake" stamp set, and adhered it to my card using some twine from my stash. I finished the card off by adding a rhinestone in the center of the snowflake. Lovely cards. I like the way you used the images as backgrounds. Love your cards - they are amazing!! Fabulous cards today Donna. Thanks for the inspiration! Am enjoying all the inspiration being shared today. Thank you. Donna your cards are wonderful! The fruit of the season is really showing a lot of versatility. I like the color you chose, prickly pear! That was cute! But using that stamp for a background looks really nice. I'm going to try that. Gorgeous! I love the layered snowflakes! Perfect way to use the multi-sized stamps! Beautiful cards. Love your snowflakes. The tone on tone pears make a wonderful background. Such great ideas. I like the tone on tone in both cards. So glad you are in this hop! Your cards are beautiful! I am so happy I was able to purchase the snowflake background stamp. It's the perfect accompiniment to the anowflake set. Love your inspiring cards. Lovely cards, nothing said Christmas like a snowflake card! Love snowflakes!! Thanks for sharing! Gorgeous cards. I love the tone-on-tone with the fruit stamps, the the snowflakes in this release are stunning. I just love Mother Teresa quotes. What a special person she was. Lovely cards. Those snowflakes are just stunning. I love what you did with Gina K's new kit! Neat cards, so sad today is the last day of the hop. Amazing job, I always look forward to seeing your creations!! Thanks for sharing. Such pretty cards! I like the pear background. Pretty pretty cards. Thanks for sharing your inspiration. Beautiful cards. Love the teal card. Thank you for sharing. Lovely cards. I really like the tone on tone backgrounds using the stamps. Great cards - love the tone on tone look! I love the bright color of your snowflake design! Beautiful work! Lovely cards! Your colors are striking & unique. Thanks for the inspiration. Wow!! Love that prickly pear on black! Beautiful cards. Lovely cards! Your colors are striking & unique! Absolutely gorgeous are these wonderful cards. I love everything about them. Wonderful cards! Love the snowflakes! Awesome tone on tone pear card and love the snowflakes. Both of your cards are bright and beautiful designs. They are a treat for the eyes and warm the heart. I love the prickly pear ink color too. The pear card is beautiful. Same with the snowflake. It is one of the best cards of the blog hop. Great cards showcasing this beautiful set! Thanks for the inspiration. Beautiful cards for an awesome release! Both of your cards are lovely. Thanks for the inspiration. I love it when ppl use a stamp that is a focal image for a background. Can you make the print on your blog larger and darker? Such fantastic inspiration using the new kit and background stamps. I love your gorgeous designs. wonderful cards, Donna - especially love the first card with that great background stamping! The cards are all great, but I just had to pin the snowflakes! I love the stacked snowflakes! So beautiful. Can't wait for mine to come in! Wonderful cards; really like the turquoise sea snowflake card. So pretty; thanks! Great cards. I like the dimension on the snowflake card. Lovely cards! My favorite is the snowflake card! So much dimension and I love the color! Both cards are beautifull, but I think I like the blue one with the large snowflake. Good ideas.